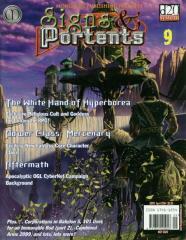 #9 "White Hand of Hyperborea, Power Class - Mercenary, Aftermath for CyberNet"
Starship Troopers – Exciting news about this newly acquired license, detailing what you can look forward to later this year. Do you want to know more? Corporate Strategy – Living in the Babylon 5 universe means a whole lot more than just bumping into TV characters or the occasional unpleasant alien. Like everywhere else, big business has its place, whether it’s space exploration or news journalism. Find out all you need to know to get by in S&P! The White Hand of Hyperborea – The tall, gaunt men who enslaved a teenage Conan, the Hyperboreans are a thoroughly unpleasant lot. In other words, perfect for roleplaying games! This detailed article contains exclusive information and rules for the cult of the White Hand, along with their goddess, Louhi. Datafile: 2089 Combined Arms – Learn how to manage your Mek team on a battlefield with popular WarMek author, Martin Dougherty. Get the best out of all the varied supporting elements available to the ultra-modern battlefield commander, be it the PBI or aerial support. Aftermath – We know you have been crying out for them, so here is the first of our OGL backgrounds, in this case a post-apocalyptic nightmare for CyberNet. This is a setting replete with familiar iconography and a sinister undercurrent guaranteed to ensnare players and their characters. 101 Uses for an Immovable Rod – Part two of this useful feature on a familiar old gamer’s friend. Everybody’s got one in their backpack, but what do you actually use it for? Johnathan Richards reveals all. Power Class: Mercenary – The latest Power Class is a complete corker, penned by Patrick Younts. Let’s face it, aren’t you fed up with altruistic characters out to save the world? Now you really can just be in it for the money!